ACS Sustainable Chem. Eng. 2018, 6 (9), 11753–11758, DOI: 10.1021/acssuschemeng.8b01998. Hydrogen production by membrane water electrolysis has attracted tremendous attention because of its benefits, which include easy separation of hydrogen and oxygen, no carbon emissions, and the possibility to store hydrogen fuel as an electricity source. 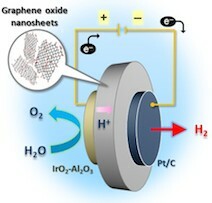 Here, we study water vapor electrolysis using a proton-conducting membrane comprising graphene oxide (GO) nanosheets. The GO membrane shows good through-plane proton conductivity, as confirmed by concentration-cell measurements, complex impedance spectroscopy, and hydrogen pumping experiments. The results also confirm that most carriers in the GO membrane are protons. The GO membrane fitted with Pt/C and IrO2-Al2O3 as the cathode and the anode, respectively, efficiently electrolyzes humidified air to produce hydrogen and oxygen at room temperature, which indicates bright prospects for this carbon-based electrochemical device.